There are many new changes coming to Heroes of the Storm today, centered around the Eternal Conflict between High Heaven and the Burning Hells in the Diablo Universe. The Butcher hero is being added to the game with this patch. The Butcher is a brutal melee Assassin who can increase his damage with each Fresh Meat he collects from slain foes. He was highlighted yesterday in a new video. His Battle Beast and Master Skin have also been added to the in-game shop. This patch also features the new Battlefield of Eternity map. To highlight this new map, Blizzard team has temporarily restricted available maps to only four — Battlefield of Eternity, Sky Temple, Tomb of the Spider Queen, and Cursed Hollow — to increase the chance everyone will get to play the Battlefield of Eternity as it launches. The full complement of battlegrounds will return July 7. The Eternal Conflict event also features a daily gold boost in the form of Treasure Goblins, which spawn before the gates open at the start of a battle and must be killed quickly before it can open a portal. Today, the Eternal Conflict begins. Are you ready? In more mundane gameplay news, several abilities across heroes have been retuned to provide a Daze effect rather than a stun. The talent Blood for Blood has been retuned to provide more healing and less damage. The Lost Vikings, Brightwing, Rehgar, and Malfurion have all been extensively revamped. The Vikings and Rehgar see mostly nerfs while Malfurion and Brightwing see mostly buffs. The Vikings have a new Trait and multiple talents balanced at every level. Rehgar and Malfurion now both have Cleanse. Illidan’s Metamorphosis Heroic Ability has been nerfed, while the completely useless Sylvanas Heroic Ability, Possession, has finally seen its long-needed buff. The struggle between the High Heavens and the Burning Hells has erupted out of the realm of Sanctuary, and the Eternal Conflict has begun in the Nexus! 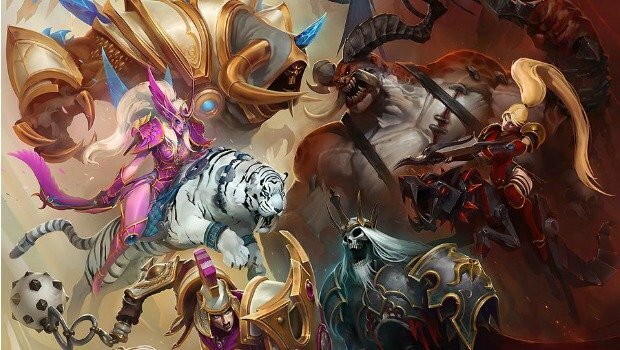 Angels and Demons now battle for dominance in their quests to destroy one another, and we’ve brought Heroes of the Storm offline for a period of extended maintenance in order to clean up after the mayhem they’ve wrought. We’ll let you know just as soon as the Nexus is back online, but in the meantime, you can check out today’s the complete patch notes below. The Fresh Meat Bundle has been added to the in-game Shop for a limited time. The Butcher has been added to the in-game Shop! Butcher’s Beast – This Mount is available exclusively by purchasing the Fresh Meat Bundle. Murky’s prices have been reduced to 7,000 Gold and $8.49 USD. A Master Skin has been added for The Butcher. The Iron Butcher Skin has been added to the in-game Shop. The Featured tab will no longer hide items that a player already owns. The “Hide Owned” checkbox has been added to the Featured Tab, and can be used to hide items on the Featured tab that the player already owns. Preview panes in the Shop once again indicate Gold prices where relevant. The “Rare Skin” label has been removed, and Hero Skins are now categorized as follows: Skin, Epic Skin, Legendary Skin. Items that a player does not already own will now indicate when they are part of a Bundle Pack that is currently available in the Shop. Click the View button on an individual item’s page to check out the Bundle Pack associated with that item. Items and Bundles that have been placed on sale will now list the original price, sale price, and discount percentage on the purchase button itself, rather than above the purchase button.